“Project 637” came a step closer to completion on October 20th. 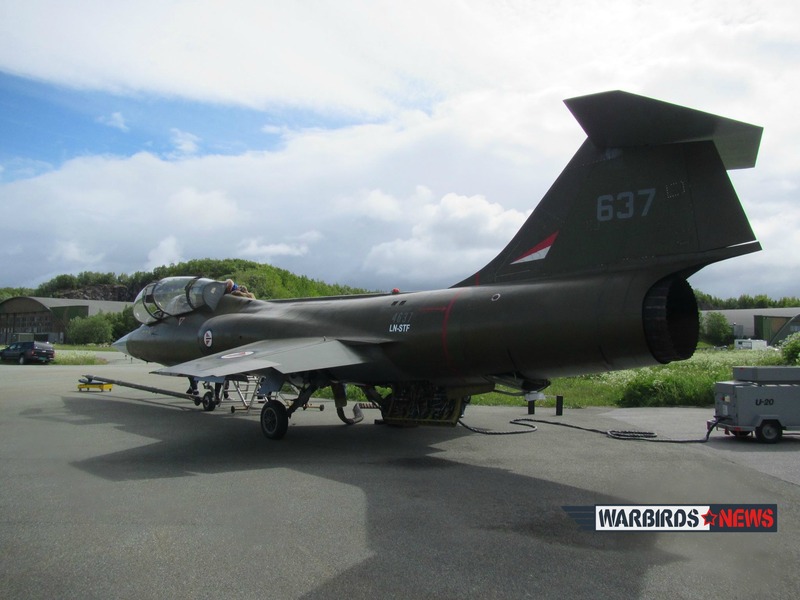 The team restoring a former Norwegian Air Force CF-104D Starfighter to flying condition successfully ran the aircraft’s engine with the afterburner in action. There was much anticipation on the day, with a small crowd gathered to witness the test. Helge Andreassen sat patiently in the cockpit with the canopy open. He started the engine in one of the base’s old Quick Reaction Alert hangars; a pair of vents in the thick, steel-reinforced concrete at the building’s rear to allow the hot exhaust gases from the Starfighter’s J-79 engine to run freely. The engine howled as Andreassen brought the throttle forward, and warbled in its particular way as he joggled it to get the aircraft slowly taxiing forwards from its shelter. The sleek, mottled green jet slithered confidently from its lair as it made its way out to the main runway for the trial run. The engine roared as it spooled up to max chat, and a blue flame flared from the exhaust as the burner hit. The Starfigher lurched forwards when Andreassen disengaged the brakes, and began to briefly hurtle down the runway… that is until the pilot pulled the thrust back to idle again. For a brief moment, though, all who stood their believed the vintage jet fighter would continue that take0ff roll, and soar up into the blue sky again, just as she will again one day in the not too distant future. 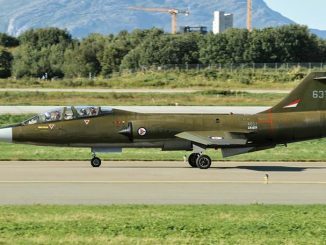 On October 20, the 104637 project team has again made a successful afterburner test run with their CF-104D Starfighter at Bodø Air Base. Now with installed MB seats. Helge Andreassen was at the controls. He stated on the question when she will be airborne: In respect of all of you who are following us. 637 is coming along, we are optimistic.We need a qualified test pilot in order to do 2-3 testflights. The pilot has been selected.If we are successful, he will be nominated TRI/TRE on the type. We have to see what comes out of it before we make future and firm plans. This particular aircraft is a two-seater, originally built by Lockheed for the Royal Canadian Air Force where she served as RCAF 104637 upon her delivery in May, 1962. She flew test flights out of Cold Lake, Alberta for the bulk of her Canadian operations, until the Norwegian Air Force acquired her along with several dozen other Canadian examples in May, 1973. The Starfigher arrived in Norway on June 14th, 1973; receiving the RNAF serial “4637″. She served with 334 Squadron out of Bodø, so it seems only fitting that she yet makes the base her home. The Norwegians retired 4637 on April 1st, 1983, and she passed into storage at Sola Air Force Base. 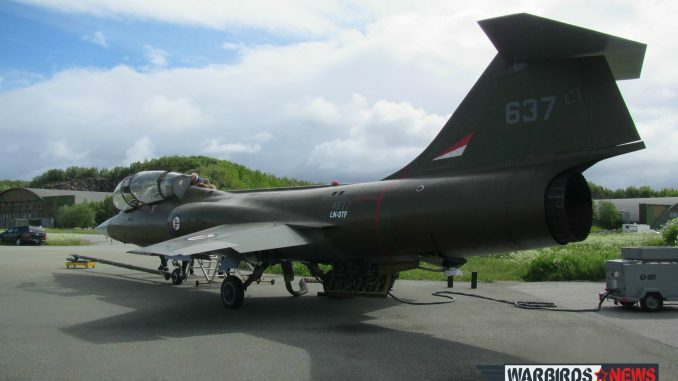 The fighter didnt’s stay in Sola for long, as a few months later it returned to Bodø where Air Force trainees used it for ground handling instruction until the early 1990s. When the aircraft went on display within the Bodø Air Museum, a group of well connected individuals decided to they wanted to see her flying again. The aircraft was in great shape, and with a little persuasion, the museum put the aircraft back under control of 331 Squadron at Bodø. This was a strategic and logistical decision to get more professional support within the Air Force for the project. The aircraft’s official support group, “Friends of the Starfighter”, formed at Bodø on January 16th, 2003. Interestingly, Rick Svetkoff and Tom Delashaw were in Bodø to celebrate this “start” of the ’637 project. These men are part of Starfighters Aerospace on Merritt Island in Florida, which currently operates a small fleet of Starfighters commercially. “Friends of the Starfighter” is receiving a lot of help acquiring missing parts, especially from the Italians whose Air Force was the last to operate the type. In September 2007 the team made good progress with a first succesfull run of the J-79 engine. The summer of 2008 saw the first runway taxy-trials. In November 2011 the aircraft received its official civil registration as LN-STF. The team hopes to fly the Starfighter for the first time before the end of 2014, but time is running out for this year. The fighter is performing really well though, but only time will tell if they are successful or not. The team has installed and tested two newly refurbished Martin-Baker ejector seats, which should suppose that indian food will now be on the local menu. This project is monumental in its undertaking, but if anyone can do it, they can. It really goes to Thomas Alexander Allnutt to follow up. To support this project please visit HERE or the group’s Facebook page. 637 was actually built by Lockheed in California, not Montreal. Canadairs did not build any two seaters. You are correct Bob, We have edited the article.